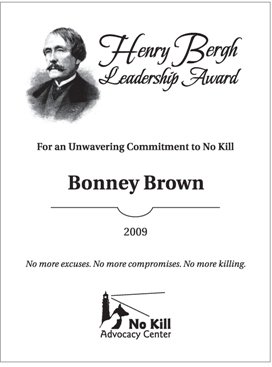 The nation’s top No Kill advocates were awarded the No Kill Advocacy Center’s 2009 Henry Bergh Leadership Award, for unwavering commitment to ending the systematic killing of animals in U.S. shelters. Six recipients nationwide share the honor. Claire Davis, President of the Coalition for a No Kill King County and Co-Chair for kcaccexposed.org. Bonney Brown helped lead the Washoe County (Reno) Nevada community to one of the highest save rates for animals in the nation. Combined, the county’s two open admission shelters saved nine out of ten dogs and cats, despite a per capita intake over twice the national average. During her tenure at the helm of the Nevada Humane Society – and despite an economic downturn that hit the community particularly hard – she has increased adoptions over 80%, cut the death rate by more than half, and virtually eliminated the deficit she inherited. Susanne Kogut repeated a similar achievement for the third year in a row in Charlottesville, Virginia. As head of the open admission Charlottesville SPCA, she has not only created a No Kill community, but she has repeated that achievement every year during her tenure. And she secured the agency’s finances ensuring stability and success for years to come. Ryan Clinton put lifesaving on the Austin City Council agenda, made No Kill a campaign issue during recent elections, and helped achieve the victory of pro-No Kill candidates culminating in a unanimous resolution to embrace the No Kill Equation model of sheltering. Clinton is not only working diligently to reform his local shelter, he is helping reformers across the country do the same. Mike Fry and Beth Nelson of Animal Wise Radio promoted the No Kill philosophy to a national radio audience, helping to redefine sheltering across the country, in addition to running Minneapolis’ largest No Kill shelter. Joan Schaffner hosted the national No Kill Conference, which brought in hundreds of shelter volunteers, staff, Board members, officers and advocates from over 30 states and six nations and spread No Kill success across the globe. In 2009, her book on litigating animal disputes was published as well. And Claire Davis succeeded in putting the spotlight—and a reform agenda—on one of the cruelest shelters in the country. Her diligent efforts are helping to give the animals of King County, Washington the care and opportunities they so richly deserve, but have been denied by a system built on a lack of accountability. The announcements were made in a special two-hour Animal Wise Radio program that included interviews with all the recipients about the groundbreaking work they are doing. You can hear a podcast of the program by clicking here (Dec. 20, 2009 show). You can also listen to the show on iTunes or at animalwiseradio.com. About Henry Bergh: Henry Bergh was a 19th Century animal advocate who launched the humane movement in North America. He gave the first speech on animal protection in the U.S., founded the nation’s first humane society, and succeeded in passing the nation’s first anti-cruelty law. Every night, Bergh would patrol the streets of his native New York City looking for animals in need of protection. To those who opposed Bergh’s attempts at saving the lives of animals, he was known as “The Great Meddler.” The recipients epitomize the unwavering commitment of Bergh to save lives, even in the face of criticism and opposition. About the No Kill Advocacy Center: The No Kill Advocacy Center is the nation’s premier organization working to end the systematic killing of animals in U.S. shelters. It is also the only national organization staffed by individuals who have created and worked in No Kill communities. Who are the Nation’s Top No Kill Advocates?